BMW knows how to play on the feelings of well-heeled motorists who love fast and safe sporty performance. 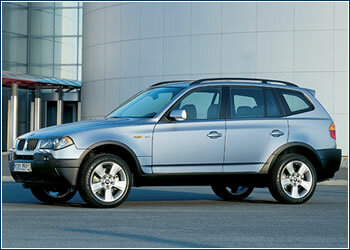 The BMW X3, a car designated as a Sports Activity Vehicle (SAV) and equipped with the unique xDrive four-wheel drive system, is proof of this. BENEATH THE finely-shaped body designed for driving over light terrain of this five-seat, 4.57 meter-long station wagon there lurks state-of-the-art technology. The intelligent xDrive system distributes torque between the front and rear wheels precisely according to road conditions, and it stands out with its lightning-fast reactions to changing situations. This gives the car extraordinary traction, on dry as well as on soft or slippery surfaces. This is because it can recognize the car’s tendency to understeer or oversteer on turns and make corrections in a fraction of a second, even before the DSC stabilization can react. The result is first-rate handling and an outstanding level of active safety for this class of cars. Thanks to its independently suspended, seventeen-inch wheels, its short overhangs in front and in back, and the chassis’s clearance of just over 200 mm, the BMW X3 need not be deterred by bad roads, and even light terrain obstacles, within reason. But it’s not a real off-road car, instead providing greater comfort and joy of driving on roads. Excellent dynamic characteristics are guaranteed by all three available engines: the 2.5 and 3.0-l gasoline motors turn out 192 and 231 hp (141 and 170 kW), and the 3.0-l turbodiesel delivers 204 hp (150 kW). Customers can choose between a manual six-speed transmission and a five-speed automatic, and all versions reach a top speed of 200 km/h. The BMW X3 with the 2.5-l engine and manual gearbox sells for CZK 1,279,000, and the base price of both three-liter versions is CZK 1,375,000.